Yesterday was the last day at BEA 2013 ... and I have to say: it was a blast! This was only my third year at BEA and it just ended, but I have to say: I can't wait until next year. BookExpo America is such a great experience with all the new free books, meeting writing ideals and mingling with all sorts of new people. Especially fellow YA book bloggers. 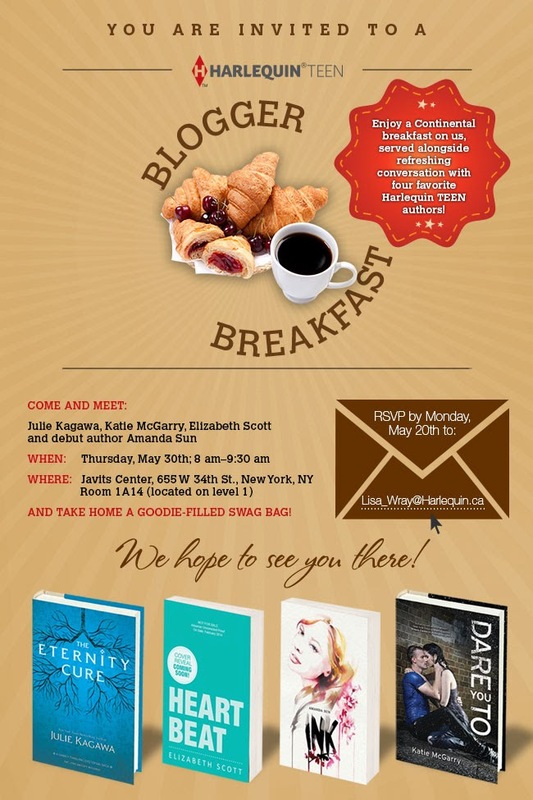 Before BEA 2013 began I received an email from Lisa Wray over at Harlequin inviting me to the Blogger Breakfast earlier in the morning. Unfortunately, finding parking was unusually difficult so I was to late to make it. However, I got lucky because I met a nice women who also worked for Harlequin and gave me the ARCs I would have received had I made it to the Blogger Breakfast. So this year, I color-coded by person (A: Me, D: Devin, etc.) the strategic times and authors to make it easier for everyone to know where they needed to be, what ARC they were getting by which author, and where everyone else was located at the corresponding time. It saved time -- as well as unnecessary headaches -- with spotty connection and texting or calling each other. Can't wait to crack open the covers of DARE YOU TO written by Katie McGarry (I absolutely love her stuff), TEARDROP by Lauren Kate, UNBREAKABLE by Kami Garcia. 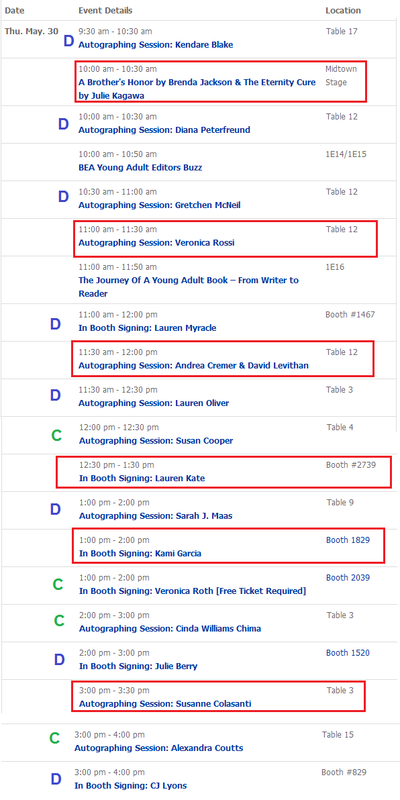 Just as the day before, my second day at BEA was quiet eventful. And I wouldn't have had it any other way. To start the morning off I attended Sourcebooks ARC drop to get LIES YOU WANTED TO HEAR by James Whitfield Thomson. Then I went over to HaperCollins to pick up Katie Cotugno's HOW TO LOVE.